Making his first official trip to Europe, Indian Prime Minister Narendra Modi visited France, Germany and Canada in early April this year. His agenda: acquiring Rafale fighter jets, boosting Indian manufacturing through the Make in India campaign, urging the EU to move forward on a stalled free trade agreement, and attracting trade and investment. Although Modi has said that he “usually tries to visit two to four nations together” in convenient clusters, the U.K. was not on his itinerary, despite some vigorous courting. While Britain has erected a statue of Mahatma Gandhi in London’s Parliament Square in an attempt to entice India, the former colonial power finds itself on the sidelines. In 2014, five prominent U.K. politicians made official visits to India, from former Foreign Secretary William Hague to Chancellor of the Exchequer George Osborne and former Deputy Prime Minister Nick Clegg. 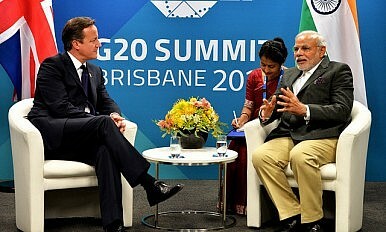 Indeed, Prime Minister David Cameron himself has visited India a whooping three times since assuming office in 2010, including twice in 2013, professing that India is Britain’s “partner of choice” and “relations with India are at the top of the U.K.’s foreign policy priorities.” In 2012, Britain was among the first countries to withdraw its boycott of Modi over his alleged complicity in the 2002 Gujarat riots – the U.S. only followed suit in 2014. In addition, Britain has steadily supported India’s bid for a permanent seat on the UN Security Council. Yet, the traffic has been largely one way, and interestingly, no Indian prime minister has visited the UK since Atal Bihari Vajpayee in 2001, barring Manmohan Singh’s attendance at the 2009 G-20 Summit in London, which naturally did not focus on the bilateral; and notwithstanding Finance Minister Arun Jaitley’s recent March visit to London, few Indian officials have done so. With the U.K. increasingly moving away from the limited colonial outlook that exemplified its view of India in earlier decades, what explains New Delhi’s indifferent response towards London’s overtures, and the U.K.’s relegation in India’s political, economic, and international calculations? Diminishing Britain’s influence is potent competition from the exporting states of Japan, France and Germany, which have each created an efficient niche. The U.K.’s attempts to tap into India’s budding defense industry have been impeded by India’s diversification of defense sources, including its widespread military links with France – boosted by the latter’s refusal to condemn India’s 1998 nuclear tests – and the U.K.’s failure to secure the sale of its Eurofighter Typhoon jets, with India opting for the lower cost French Dassault Rafaele jets instead, making France India’s largest European defense partner. (The U.K.’s offer of its Eurofighter jets to India has been recently renewed by Cameron, who claims that his deal is better.) German industrial expertise can contribute to India’s development and infrastructure projects including rail networks and smart cities, as reiterated by Steinruecke of the Indo-German Chamber of Commerce. Japanese technology, investments, and aid in India’s infrastructure projects, including the construction of smart cities, Delhi’s mass rapid transit system, and the Delhi-Mumbai industrial corridor, plans to further defense and security cooperation, not least to counter Chinese aggression, in return for rejuvenation of its moribund economy through exports and investments to a rapidly flourishing India, have paved the way for a promising partnership. Despite Cameron’s latest assertion that Britain is a better partner for Modi’s Make in India campaign, in comparison to the likes of Germany and Japan, the U.K. appears to have comparatively little of an exclusive or a unique nature to offer India. Certainly, India can benefit from Britain’s impressive historical expertise and know-how in technology and innovation. Additionally, a large number of British firms operate in India, not least Vodafone, Unilever, Diageo, and British American Tobacco. Indian firms prefer Britain for FDI, and British banks lend more to India than any other country. But while countries like Japan and Germany have been eager to invest in India’s growing economy and the large number of infrastructure projects, the U.K. has been more reluctant to do so, including plans to invest in India’s ambitious 1,000 km Mumbai-Bangalore corridor. Strategic cooperation between India and Britain is being strengthened, especially in the realms of counter-terrorism and civil nuclear cooperation. However, the U.K. has concurrently pressed for a bigger role for Pakistan in Afghanistan, continuing its historic pro-Pakistan incline – something that naturally does not sit well with India. Far from writer Patrick French’s critique of Britain’s narrow-minded colonial mindset and its subsequent incapability to fathom how India is growing, Britain’s recent attitude exhibits a pragmatic necessity and appreciation of engaging with a rising India. India’s reactions are also characterized by pragmatic reflections, including an acknowledgement of Britain’s fading international clout. In the transactional and ephemeral world of international relations, historical links and shared values matter, but ultimately the future of the relationship will depend on India’s evaluation of what it derives from the ties. This will determine where Britain stands on India’s radar and how much political weight India is willing to invest to deepen the level of engagement. Overall, the evolving Indo-British relationship reflects shifting geopolitical realities, including a significant change in the global balance of power, a multipolar world in which India is an emerging power, and a Britain that is no longer the great power it once was. Shairee Malhotra is a Mumbai-based analyst. She has an MA International Relations from Queen Mary University of London, and has worked as a researcher at foreign policy think tank Gateway House: Indian Council on Global Relations.